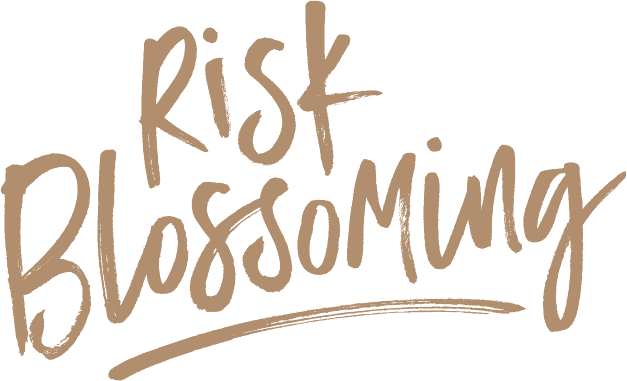 One of the many joys of rediscovering and exploring some of our Risk Blossoming destinations is remembering and reliving our previous experiences and emotional memories. Have you experienced this sensation of revisiting a place that brought back memories or a specific moment? Some of these memories might have laid dormant and forgotten for years. The memories might bring back the sights, the experiences, the emotions and sometimes you get the opportunity to relive some family lore. 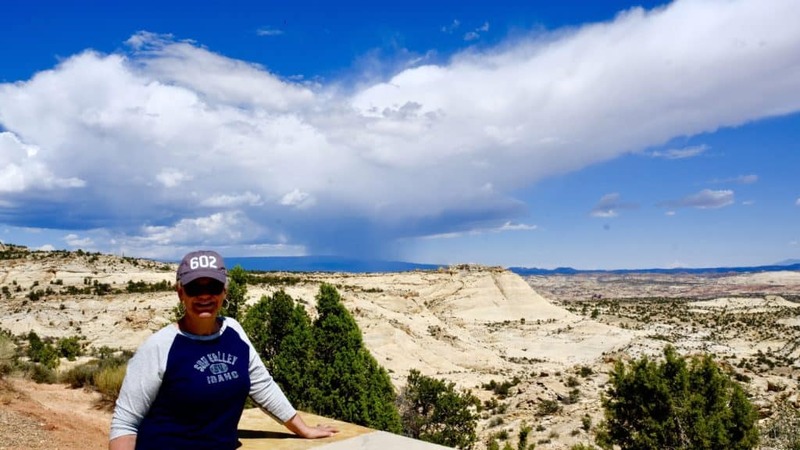 That’s the kind of nostalgia we enjoyed on our recent trip to Bryce Canyon National Park and the Grand Staircase-Escalante National Monument. 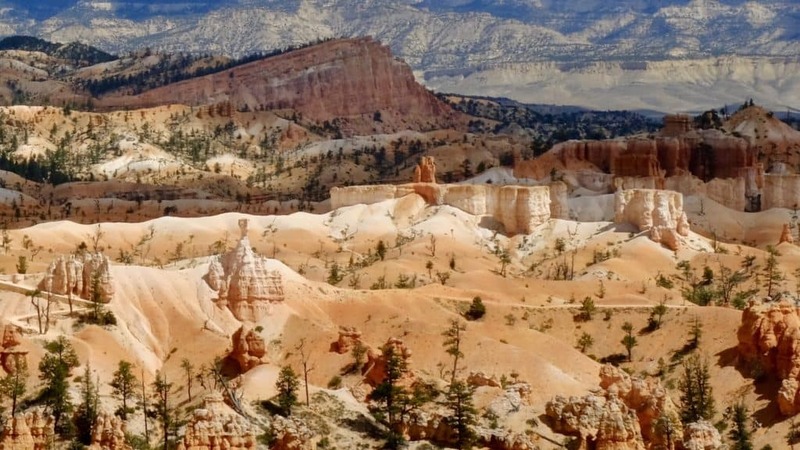 Bryce Canyon is a collection of amphitheaters created through natural erosion rather than a true canyon created by erosion from a single river. It is named after Ebenezer Bryce, who homesteaded below what is now the Bryce Amphitheater in the 1850’s. After a combination of overgrazing the land and the lack of water took its toll, Ebenezer left the area. Then, in 1923, because of its unique and scenic beauty, President Warren Harding proclaimed the land a National Monument. 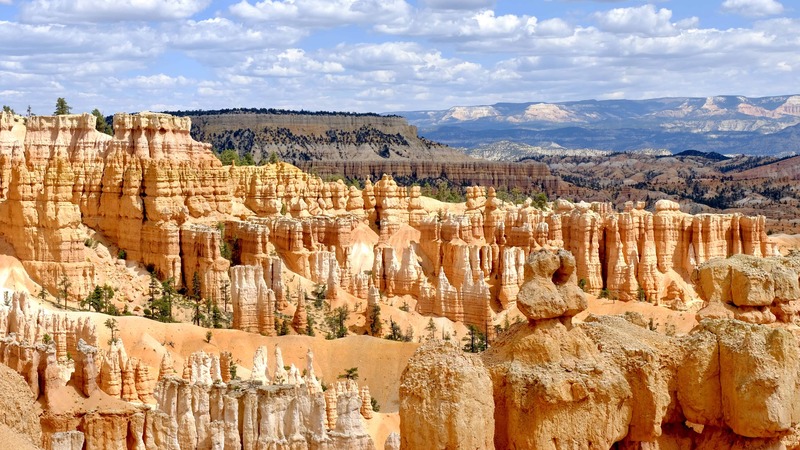 In 1928, Congress redesignated Bryce Canyon as a National Park. This year, we actually drove BAM 16-miles past Bryce to Cannonville and parked at the Cannonville KOA Holiday Campground. Lucky for us, our stay included the traditional Saturday night, KOA ice cream social. 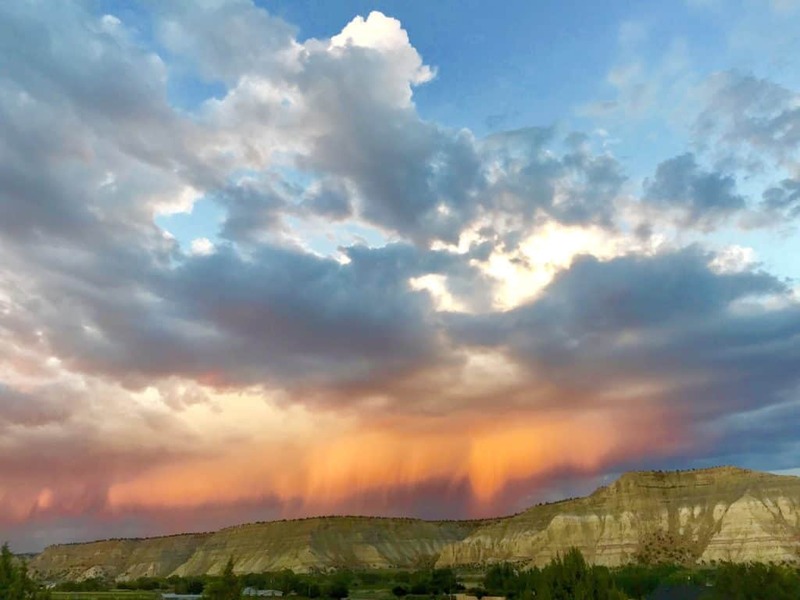 It was there that Mother Nature provided a very special light show over the Paria River ridge to our east. 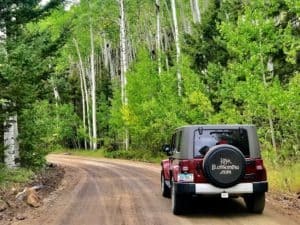 Cannonville sits on the western end of Utah’s first All-American Road — Scenic Byway 12. Our first day exploring, we drove east on 12 for about 40 miles. 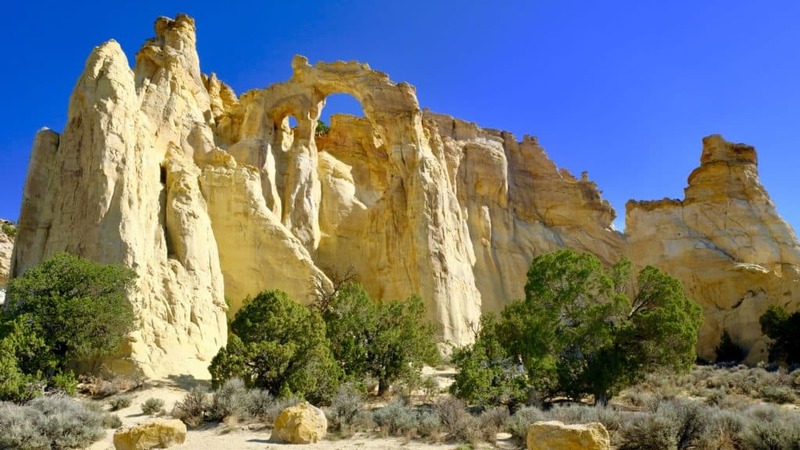 It skirts the northern side of the Grand Staircase-Escalante National Monument. 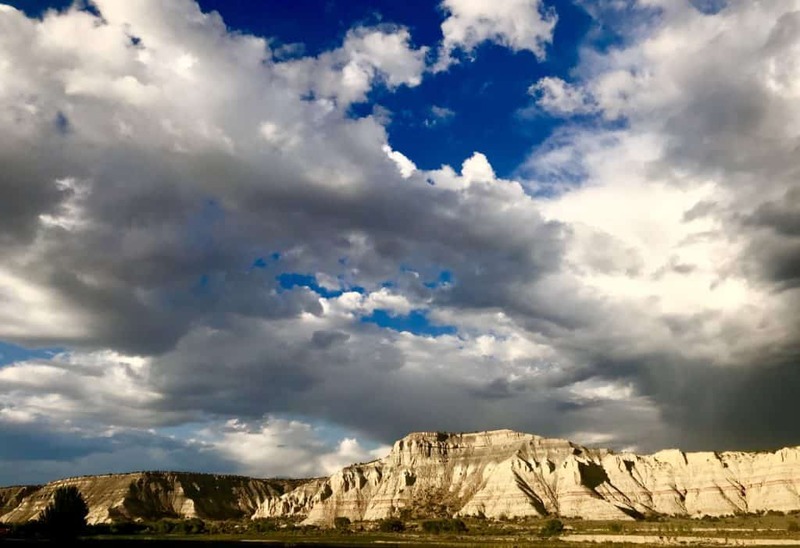 Within the monument, we discovered Grosvenor Arch, The Escalante River Overlook, Hells Backbone Road and the Hole-in-the-Rock Interpretive Center. We rose early and traveled about 6 miles down a gravel road to Grosvenor Arch. We were the first visitors of the day to this triple span arch. There had been a very heavy rain in this high desert a few days earlier. The roads were damaged but the morning air, the formations and the plants were all crisp and clean. It was a great discovery, quiet and quite inspiring and uplifting. I first became fascinated by the Hole-in-the-Rock when I saw it from the bottom during my first trip to Lake Powell in 1970. I have never seen it from the top side and unfortunately, we did not have time to travel the rough dirt road for the 120-mile round trip to see it on this day. However, we were able to stop and visit the Hole-In-The-Rock Interpretive Center. In 1879, 250 Mormon pioneers with 1,000 head of cattle and 83-wagons spent over a year in this one spot. 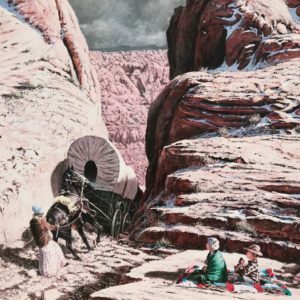 They were seeking a shortcut to cross the Colorado River and settle Southeastern Utah. 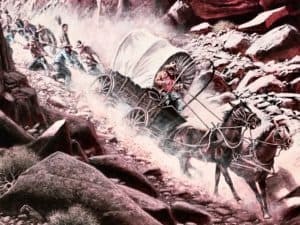 First, they blasted a slot through the top of the cliff and then, one-by-one, lowered each wagon down the 1,200-foot, nearly vertical, rocky crevice to the river. Hell’s Backbone Bridge is another testament to pioneering fortitude. 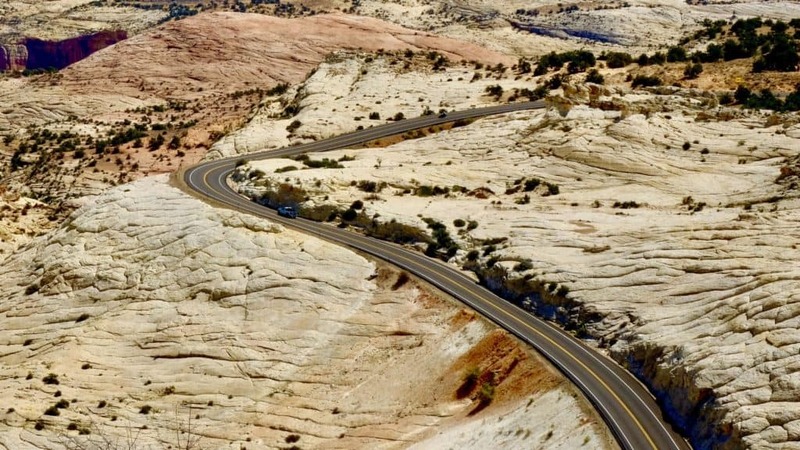 Once again, it was built as a shortcut from Boulder, UT to Escalante, UT. 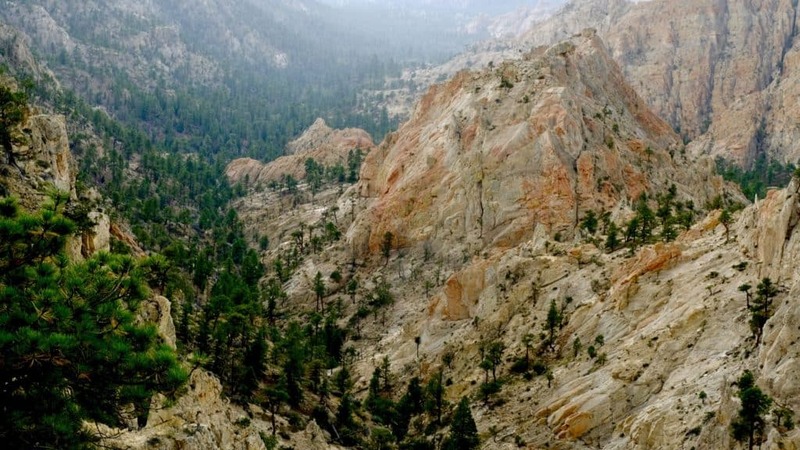 It spans the small gap at the top ridge where two impassible and very vertical canyons meet — Death Hollow and Sand Creek. The original bridge was build in 1933. I honestly don’t even know how they found this spot. After spanning the gap with two large timbers, flattened on the top, local rancher Lorrel ‘Sixty’ McInelly agreed to drive his bulldozer, and pull a compressor, across for work that needed to be done to complete the bridge on the south side. 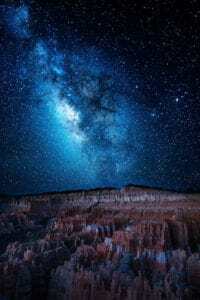 With a safety rope tied around his waist, he slowly inched across the two timbers which formed a backbone between the thousand-foot falls into each canyon. That evening, we decided to drive up to Bryce Canyon to enjoy the sunset. Passing the lodge, once again, the memories of young Matt again flooded our conversation. As our waiter approached 29-years ago, Matt did not wait for specials to be announced nor for the ladies to order first. It was stated with considerable sophistication, especially for a young boy from Malcolm, Nebraska, population 350. To this day, when ordering, I always state, in a low and slow voice. “For an appetizer, I’ll have …”. 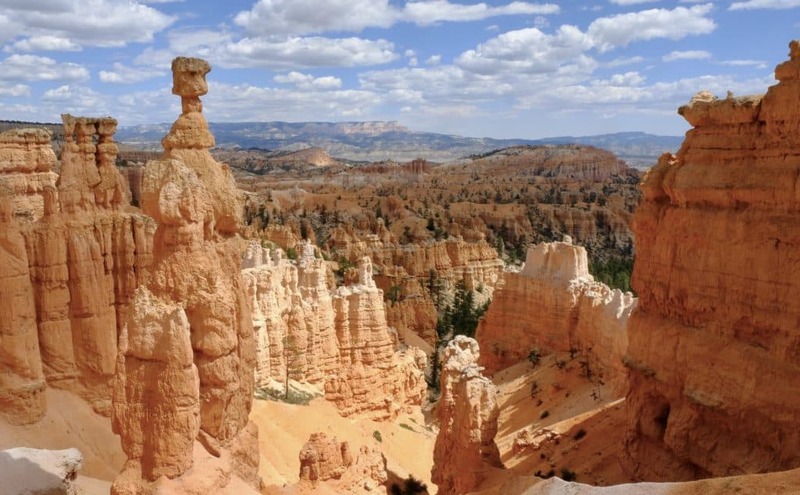 Bryce Canyon is dominated by crimson-colored, spire-shaped hoodoos. 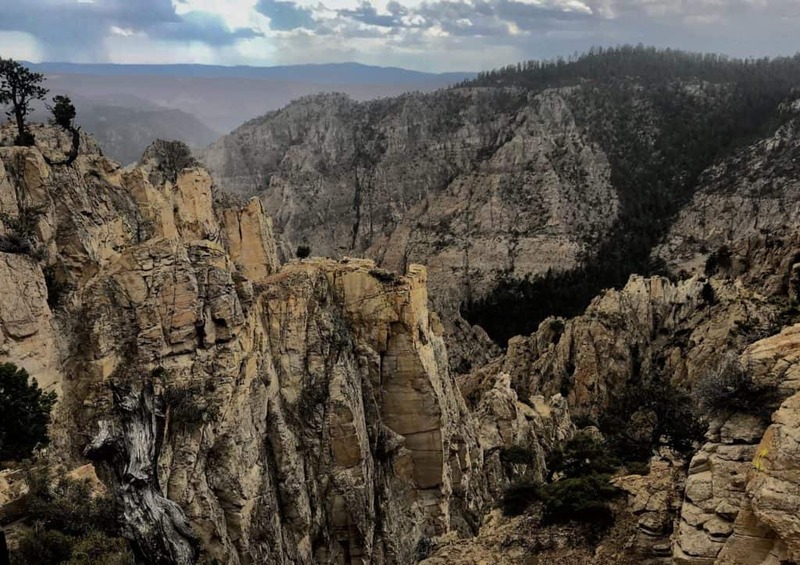 Setting between 8,000 and 9,000 feet in elevation, it is much higher than Zion National Park, which sits to the Southwest. The combination of elevation and remote location produces some of the darkest skies in the U.S. I was shocked the first night when I looked at the Milky Way. It was a continuous band of light from horizon to horizon. Stars were bright, dense and 3-D in depth. Mars, to the southeast, was a very noticeable orangish-red color and Venus, to the west, was brilliant without a twinkle. As our family dinner continued years ago, we were amazed at how much a 16-year old could eat. Matt proudly proclaimed he could always eat as much as he wanted and not gain weight. I think the words genes and jeans have been interchanged as the story has been embellished throughout the years but to this day, as for weight, Matt still has chunk-less jeans. 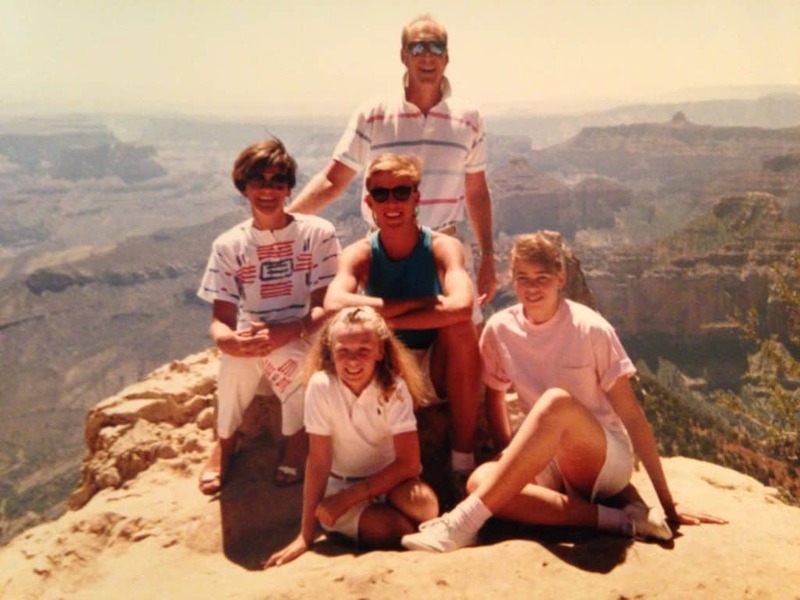 There were five of us on our forever memory trip in 1989. Along with Matt was our niece Traci, also 16, and our daughter Tara, nine. Our room had one queen bed, two roll-aways and a sleeping bag on the floor. Needless to say, it took quite a while for some of us to get to sleep. We were finally sleeping peacefully and all was quiet until about 3 a.m. Matt was apparently having a good teenage dream when he suddenly sat straight up and woke everybody by loudly, definitively and slowly saying “GIIRRRLLLLS”. Travel memories are the best. Matt provided lore at Bryce Canyon that none of us will ever forget. Since then, we have all gotten together only a handful of times, but when we do, Matt is the most interesting man in the world. He has grown up to be an outstanding individual, a bicycling legend in Nebraska, and a happily married man, to his wife Laura, for over 23 years. Matt now has his own family, first fostering and then adopting two beautiful daughters. Humor is flattery, something Matt richly deserves. Obviously, Tim and I love to travel. And the more that we do it, the better we get at it. At the core of our passion to travel is our purpose to live a Risk Blossoming life of exploration, discovery, and growth, both personal and spiritual. This stopover at Bryce brought back wonderful memories of spending time with our family, one summer, many, many years ago. It was wonderful to recall the antics of our nephew during his rambunctious teenage years. We laughed and enjoyed him 29 years ago, and we laughed and enjoyed the memory of Matt’s teenage self and his “Mattisms,” again on this trip. It is moments like these that can define a trip and keep it ever so clear in your mind for years to come. I believe that travel enhances the opportunity to create memories. There are, at least, two factors present that reinforce the creation of these indelible memories, when we travel. One is the power of the moment – because travel and vacations are most likely not routine. They are something unique and special to start with. And second, many times, travel and vacation are moments of connection. The times that bond us with others, where our feelings and emotions are most likely heightened. Some people live in the past. Not me, I have certainly learned from my past – but I resolved, a lifetime ago, not to reside there. I love living in the moment. Being fully present, appreciating the world around me, and using all my senses. In addition, I generate so much of my personal energy and fulfillment from being a forward-facing individual, anticipating and planning for a better tomorrow. But the pure pleasure and enjoyment of these memories this week caused me to stop and think. I believe that I can now appreciate the value of all three places. Perhaps the past’s memories are like the whip cream and cherry on top. They can certainly be engaging, joyful, amazing, and motivating!. Besides being personally enjoyed and cherished, memories are something that we can easily share. And, memories are easy to maintain and store. They take no shelf space. They are neatly and compactly kept in our minds, to be recalled and enjoyed at our discretion. What is the legacy that you hope to leave? As I think about the legacy that I want to leave, I hope it will be one of wonderful memories with family and friends. “Legacy is not about leaving something for people. By intentionally creating and leveraging the power of the moment and those moments of connection, we can all create a legacy of memories. Planning vacations, retreats, and Wisdom Quests that break us out of the routine and allow us to risk blossoming, and being fully present and available to friends and family, will allow us to create those beautiful memories that we can celebrate and enjoy again and again.